To understand how multiple myeloma cells grow in their native environment (the bones), researchers have sought ways to mimic those conditions in the laboratory. Tumor cells grow, migrate, and resist therapy very differently in 3D versus 2D culture conditions. 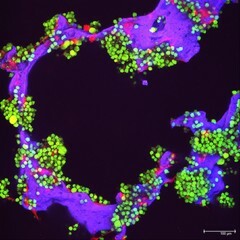 This image shows myeloma tumor cells (in green) and bone cells (red) growing on a scaffold made of silk protein (purple), which is designed to resemble bone material. By using a patient's own cells, these models enable efficient screening of patient-specific responses to therapeutics and interactions with bone marrow cells.